Happy Chanuk-Giving-FriSaturday- an updated post! In just a few short days our family will be starting a holiday marathon! Thursday brings us “technically” Thanksgiving which this year will be known as Chanuk-Giving-FriSaturday . Now before you start commenting that I have lost all synapses in my brain- hear me out. We celebrate Chanukah in this household. (A minor Jewish holiday made very important thanks to Hallmark and a few other corporations.) As the stars and moons would have it- this year the Jewish calendar mandates that we celebrate Chanukah the first week in December, not even a full week after USA Thanksgiving. Since our family will be together on Thanksgiving we decided that sharing gifts only a few short days early won’t be so terrible. So, as soon as we clear the Thanksgiving dishes we will crack out the menorah and an assortment of dreidels. I am really hoping that no one spills gravy on the Thanksgiving tablecloth as that could interrupt the velocity of these charming wooden and plastic tops. As soon as the dreidels are spun, latkes are cooked and presents are exchanged we will then celebrate another family holiday- BLACK FRIDAY. Of course, I would like to think that ALL my holiday shopping will be accomplished before Thanksgiving, but why bother! Black Friday has become a family tradition and is often just too much fun to pass up. It begins with the ritual scanning of the internet and newspapers a week prior. Then after Thanksgiving we “map out” the course we will take. If necessary, we achieve maximum coverage by dividing and conquering in three separate cars. Phones will be charged for last minute consultations. And of course, we will all have a copy of “THE LIST”. This list consists of priority items first, followed by “if it is a good sale items”, and ending with “just because”. One year a new television went from “just because” to “priority” in a matter of seconds due to the testerone makers in our household deeming it so! While others choose their routes by best sales, opening times, and proximity to other stores- I determine my top picks by who has coffee ready and waiting for the early bird customers who have yanked their bodies out of bed at 4 a.m. Last year I ditched the testesterone makers at an electronic store while I hopped over to Staples. While waiting at 5:45 for the doors to open I was treated to not only FREE and hot coffee but a Dunkin Donut (and not the boring kind of donut either!) I could care less how long the lines were after the first half of the caffeinated cup hit my bloodstream and I even purchased a few “just because” items . Then after a well needed nap we will now start to plan for a brand new family event- SMALL BUSINESS SHOPPING SATURDAY! This is when you focus all your attention and wallets on small businesses…. if you need a little help with direction may I suggest that you start at MOMMY PERKS– http://wwwMommyPerks.com. Supporting work at home parents (WAHM) and small biz parents is good for the economy. Consider it a warm fuzzy shopping experience. Now feel free to share your family holiday celebrations or tips on this years’ best Black Friday deals. Happy Chanuk-Giving-FriSaturday everyone! 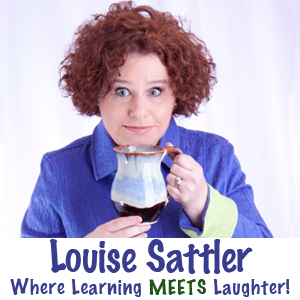 Louise Sattler is a psychologist, owner of Signing Families™, host on HerInsight Media, wife and mom! This year she is looking forward to discovering great stories from real fun and funny people for her new Educast series. Want to join in on the fun? Submit your story to Louise at info@signingfamilies.com for consideration. I love everything about the holidays…the smells, family being together, the food, memory-making, just all of the “festivities” in general. One of my strongest memories is of coming home every year on Weds evening before Thanksgiving to the smell of sautee’ing onions and celery for the stuffing. I love that smell to this day, and it would not be the holiday without it. I have a particular fond memory of my roommates and I decorating a “Christmas Tree” for two of us, and a “Chanukah Bush” for one of us in our MSU dorm room (Can you believe they packed three of us in a dorm room? I KNOW, right?) There, I learned the “Dreidel” song and we all celebrated our various family traditions before leaving for the celebration with our respective families. Still in touch with all of those roommates and dorm-mates! LOVE doing Black Friday shopping with my sis on the rare times we are able to be together for the day! I love Hanukkah, latkes, dreidels, etc. And Thanksgiving too. Where did this year go? I only went to a Black Friday sale once and I don’t think I’d go again. I’m having one online and I’ll be looking online for gifts for the in-laws. I went Black Friday shopping once. I don’t do well in crowds so I never returned. LOL. I do shop Online, of course, supporting small businesses in my community. I would like to try Black Friday shopping again this year. Now that we live in a very small town the crowds will be much (much) smaller. Perhaps a few elk, deer and skunks will be around but other than that – I’m pretty sure the antique shops will be nice and quiet. Okay. I’m DOING it! I AM! Watch me.